Fiocchi's 223 ammo loaded with Hornady's V-Max bullets is a winning combination. Shooters love the accuracy that this ammo brings to the field combined with its effective terminal ballistics. 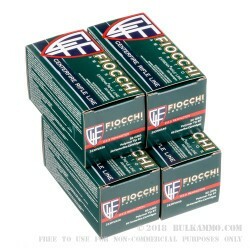 Fiocchi's 223 Rem ammo loaded with 50 grain v-max bullets shoots tight groupings in AR-15's without paying the high cost of match ammo. Whether you're looking to shoot prairie dogs or other varmints or you're looking for a very accurate target load this is an excellent choice. The v-max projectile is purpose built by Hornady to have excellent concentricity providing very stable aerodynamics and upon entry into a target designed to provide explosive fragmentation ensuring a quick kill of varmints. This ammo is loaded to an approximate muzzle velocity of 3,300 feet per second. 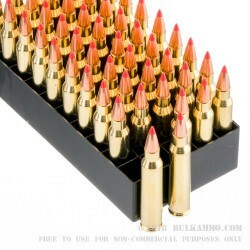 Conveniently packaged in a bulk 200 round plano polymer ammo can, this is packaged in a fashion making it portable to carry back and forth to the range and great for storage in the meantime. 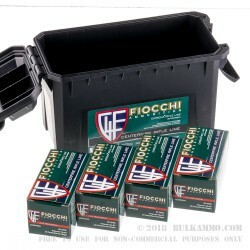 Fiocchi uses quality brass so if you're into reloading this is a solid brass to work with. Try a case today and see the accuracy difference compared to standard ball ammo. A: Hello! 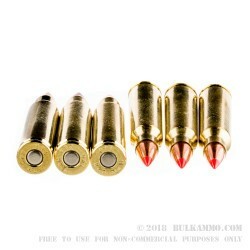 This ammunition is loaded specifically to .223 specifications. Since they are loaded to a lower pressure, they can be used in rifles chambered for .223 or 5.56 without issue.